Today we started the process of creating the bottom steps from the Plot Level to the Fire Pit Level. We are creating Earth Steps, down from the plot level, and then timber stairs that will take you to the ground level and across to the (proposed) deck and fire pit. 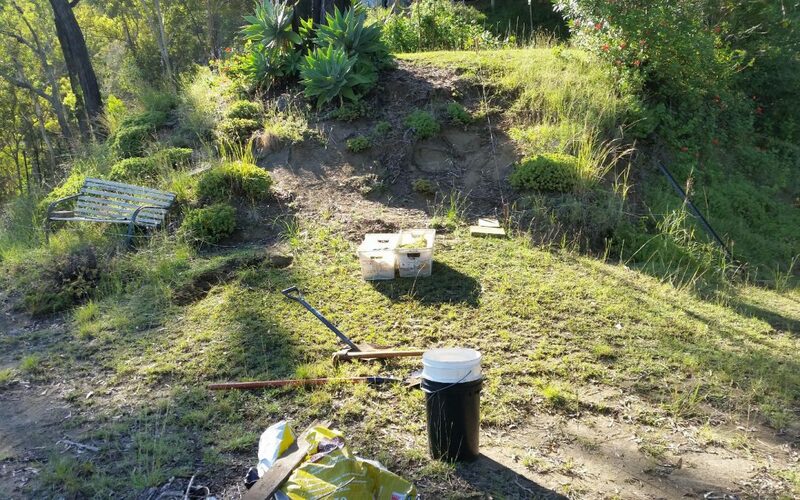 This is in conjunction with retaingin and timber walls that will ‘hold back the hill’ and al;low us to do some permanent planting to help deal with the water loss and erosion. The first steps are excavating the soil washed down from the plot level by erosion, and attempting to create a level base to build the stairs on. You can see in the side-view(below) that there is a significant scar in the Plot hill, that has washed down a level and created a sloping bank below. The washed down topsoil creates a sloping bank. 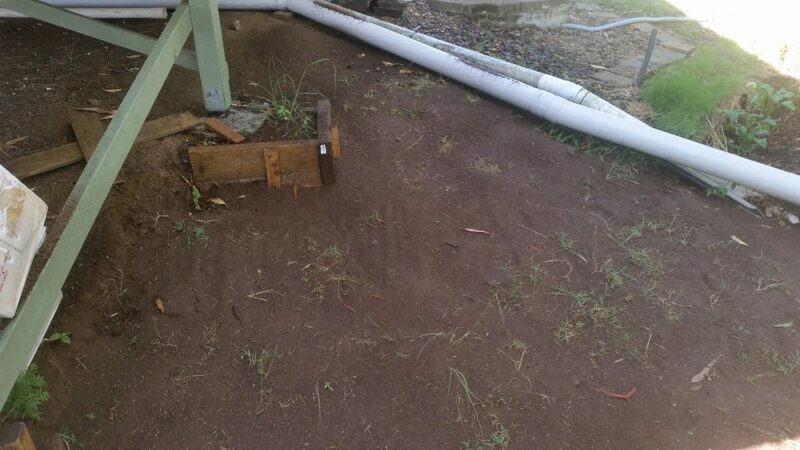 So we have to take out this “soil” and put it back in the hill once the steps and stairs are constructed. 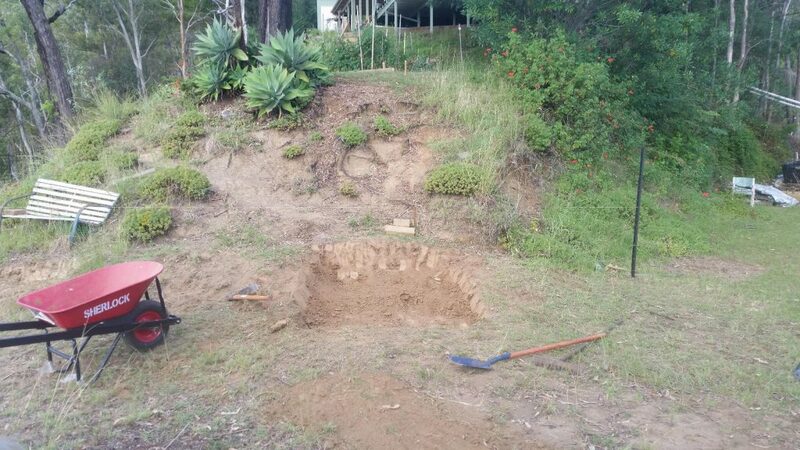 The soil excavated was saved, and the grass removed and placed in the re-built SW corner of the house. This will really help again with erosion and the loss of vegetation on this corner. Replanting the grass on the SW corner. As always, excavating by hand is not easy.. especially when 20-30cm down the “soil” turns to rock. This is common across the property, where the soil has been drained of moisture, nutrients and organic matter. The remaining soil forms a hard rock like base that is difficult to break up and excavate. 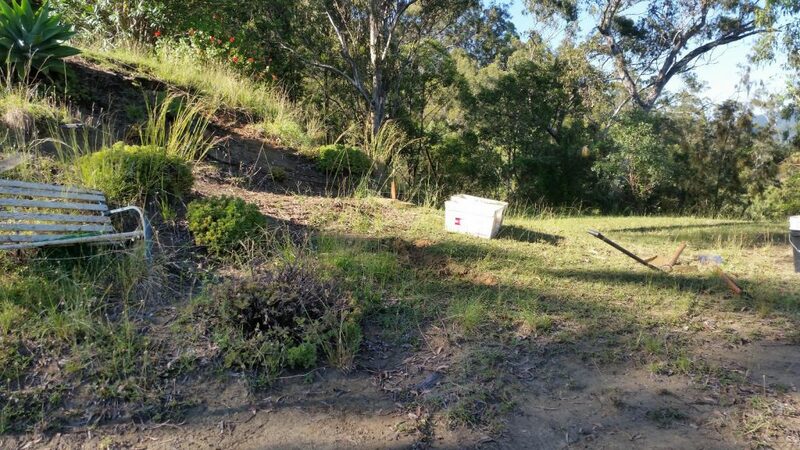 We simply do not have access for a dingo, bobcat or excavator… so hand excavation is our only choice… and it keeps us fit. This is just the beginning of what will be a substantial change to the property, so stay tuned for more progress.